If a muscle is stretched (lengthened) beyond a certain point, it will contract (shorten) forcefully, much as when we create tension in a rubber band by stretching it and letting it go quickly (plyometrics principle). Before we deliver a punch, the stretched shoulder muscle will contract like a rubber band. All punching techniques take full advantage of stretch reflex to produce maximum force. The punch is a successful kinetic chain that releases energy at rest to energy in motion or force. 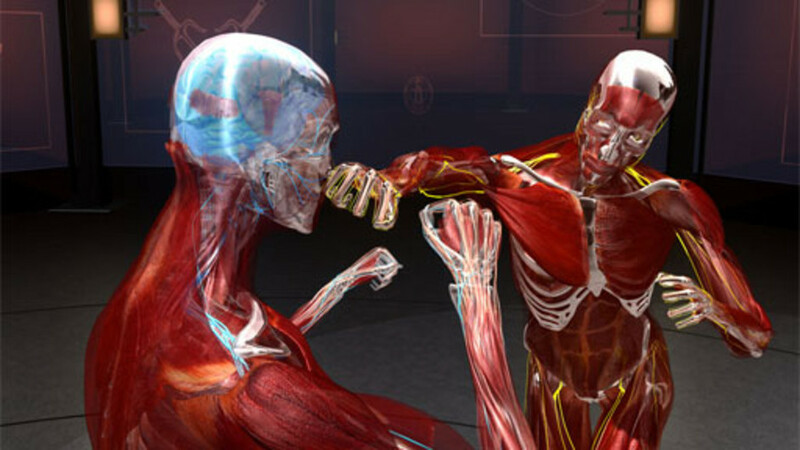 The punch starts from the lower limbs and ends at the fist. The punch starts with the right foot back. The right foot creates a plantar flexion (which primarily uses the gastrocnemius, soleus, and plantaris muscles). After the plantar flexion occurs, it is follow by the rotation of the right hip in the longitudinal plane. The rotation is then followed by a rotation of the torso, as the result of the flexion of the right internal oblique and left external oblique. As the rotation of the lower and mid body occurs, the right scapula is raised, and the flexion of the glenohumeral joint occurs (mainly caused by the pectoralis muscles, anterior deltoids, and latissimus dorsi). Finally, the elbow joint is extended, as a result from the flexion of the triceps. The end result; a punch.